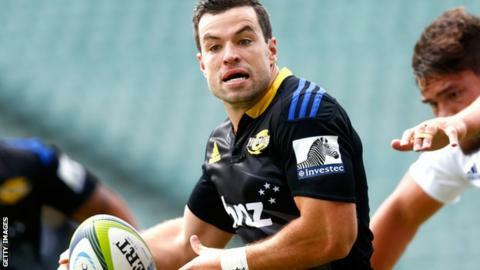 London Irish have signed fly-half James Marshall from Super Rugby franchise Wellington Hurricanes for next season. Marshall, 27, will join the Exiles following his commitments with the New Zealand Sevens squad. He played a crucial role in helping the Hurricanes reach last season's Super Rugby final and will be part of their squad for the 2016 campaign. "I'm looking forward to joining Irish next summer and being a part of the club," Marshall said. Irish's head of rugby operations Glenn Delaney called the signing "a huge statement of where we want to take this team next season". He added: "He's comfortable at both fly-half and full-back and possesses great game management skills."